Europe is on track to end 2017 with a record $19 billion worth of tech investments, according to a report from VC firm Atomico, meanwhile the European tech industry is in the midst of a ‘Battle Royale’ for talent that is showing no signs of slowing down. The State of European Tech 2017 was published this week at the Slush conference in Helsinki. It has collated data from surveys, Dealroom.co, LinkedIn, Stack Overflow, EIF, and several other sources to provide a comprehensive guide to the health of the European tech industry, from investment to regulation and talent shortages to gender diversity. In 2017, $19 billion was invested in European tech companies, up from $14.4 billion in 2016. Data for the remaining weeks of the year is based on projections. There were more than 50 funding deals that crossed the $50 million line, including The Netherlands’ Picnic, which secured $110 million and Spain’s Cabify taking in $100 million. There are now 41 tech companies in Europe that are valued at more than a billion dollars, such as Angry Birds maker Rovio (which went public this year) and Slovenian gaming company Outfit7, which was acquired for $1.1 billion. The UK is still the biggest recipient of VC funding, taking in $5.4 billion in 2017 ($2.5 billion for Germany and $2.1 billion in France). However, there were more deals closed in France this year than in the UK. Deep tech, in particular, has caught people’s attention. Investors have pumped $3.5 billion into the field – robotics, AI, blockchain, autonomous vehicles – in 2017 (up 40% from last year). Examples include Improbable raising more than $500 million from Softbank. 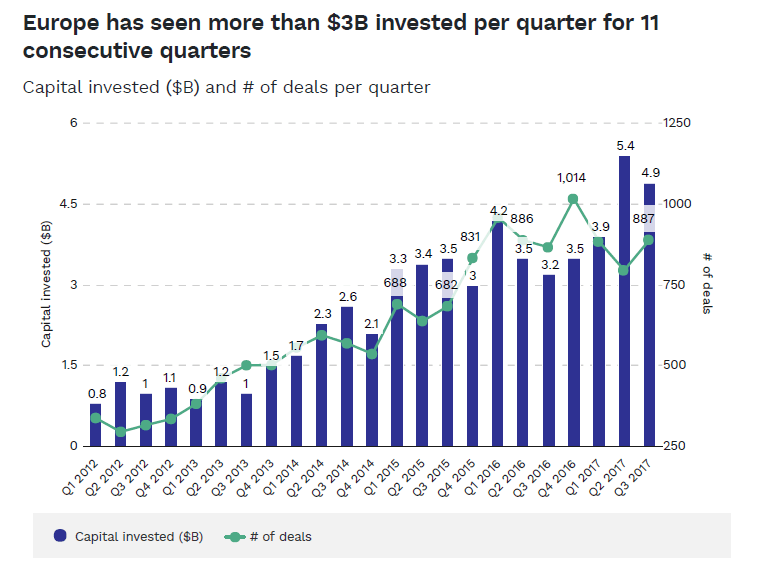 More than $3 billion has been invested in Europe per quarter for 11 consecutive quarters with fintech being one of the biggest verticals that VCs are putting cash into. There was however a decline in the number of deals below $2 million. The median Series A round is now $5.5 million, up from $3.3 million five years ago. 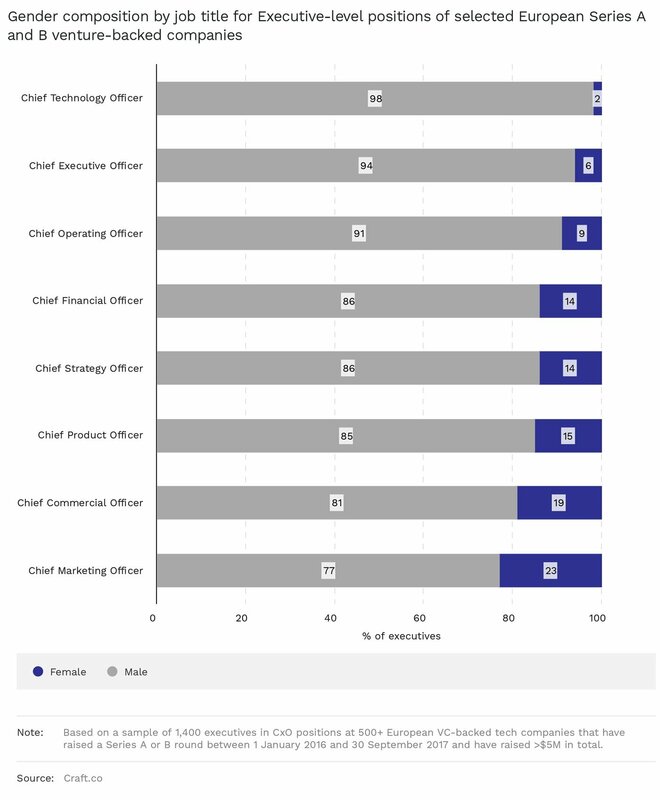 The competitive landscape among VCs in Europe has pushed this average up. There’s more cross-border investment activity with 33% of investments made by European VCs going into companies in other countries. The big four cities of London, Berlin, Paris, and Stockholm still dominate but there has been a steady growth in the capital invested in so-called second tier cities like Amsterdam, Munich, Oslo, and Barcelona. In terms of investment per capita, Europe is still far behind Israel and the US but there’s also been an increase in the number of Asian investors putting money into Europe. As far as exits go, Europe is on track for about $75 billion in M&A exit value in 2017 and in the first nine months of the year, there were six tech IPOs of a billion dollars or more, including Delivery Hero’s IPO raking in $1.1 billion and Rovio making $1 billion. It’s not just companies. VC themselves have raised more money for their funds than before. Since 2016, VCs have raised €10.6 billion for funds. However there has been a slowdown in the number of first time VC funds being launched. The tech workforce in Europe is growing three times faster than the EU average and there are some 5.5 million professional developers in Europe. The continent is home to half of the world’s top computer science institutions while one in five MBA graduates from Europe’s top business schools are entering the tech industry. This drive for talent has seen founders look to Europe’s “untapped talent pools” in Central and Eastern Europe and opening more satellite offices, with teams distributed across multiple locations. Atomico describes the hunt for talent around Europe as a ‘Battle Royale’. Competition is not just with other startups – the hunger for talent has been exacerbated by US tech companies. Giants like Apple, Alphabet, Amazon, and Microsoft acquired 10 European tech companies in 2017 including Fayteq (Germany) and Donya Labs (Sweden). European founders now have more competition in securing the talent they need while the median salaries for a lot of these professionals are going up. According to data from Glassdoor, the salary for a software engineer at, say, Google is 1.5x higher than the London average. Unsurprisingly, the migratory flow of talent remains towards the west. 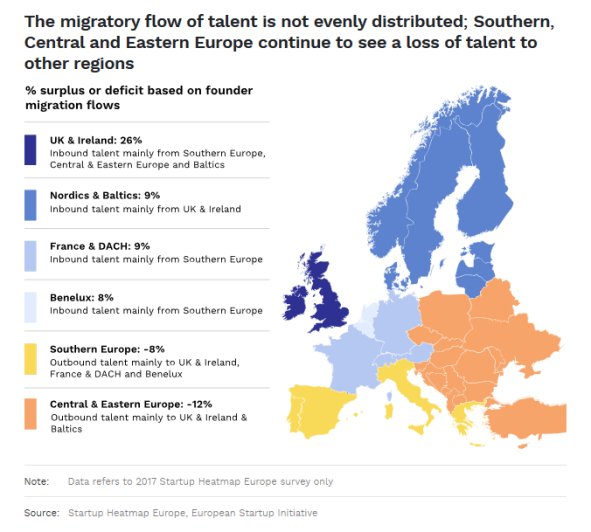 A lot of talent tends to leave Southern and Central Eastern Europe for positions in the Nordics, Western Europe, the UK, and Ireland. Access to talent still influences a founder’s decision on where to locate. For tech talent coming to Europe or moving within the continent, the UK is the number one destination to find work but it has lost some of that share to Germany and France over the last 12 months. 21.5% of international migrants, working in tech, went to the UK followed by Germany (13.8%) and France (9.1%). The UK saw 3.2% growth in tech jobs overall. Despite the fact that a lot of workers are going to the UK and some startups raised considerable amounts of money this year, there are still a lot of fears over Brexit (you may have heard of it). Amid the ongoing confusion and tumult over the UK’s exit from the EU and negotiations in the halls of Brussels, optimism has taken a hit. The State of European Tech survey found that 18% of UK respondents were less optimistic about the future of European tech compared to a year ago. The opposite is true in France, Germany, and the Nordics. 2017 was dotted with a series of important political events in Europe that have had knock-on effects on the tech industry, from the triggering of Article 50 to the election of Emmanuel Macron. Of the respondents, 32% of UK founders said they now find it harder to raise money than in 2016. The triggering of Article 50 spooked UK respondents much more than their counterparts, as shown below. The UK is the only country among the respondents that found it is now harder to raise money than a year ago. On the other hand, the election of Macron has reportedly boosted confidence in the French tech sector and its place in Europe. “There was a lot of self-bashing in France, lots of people saying that ‘it is much better in the West – especially in the tech ecosystem, it is much better in Silicon Valley, it is better in London, and so on.’ We were kind of self-hating on ourselves,” said Romain Lavault, general partner at Partech Ventures. 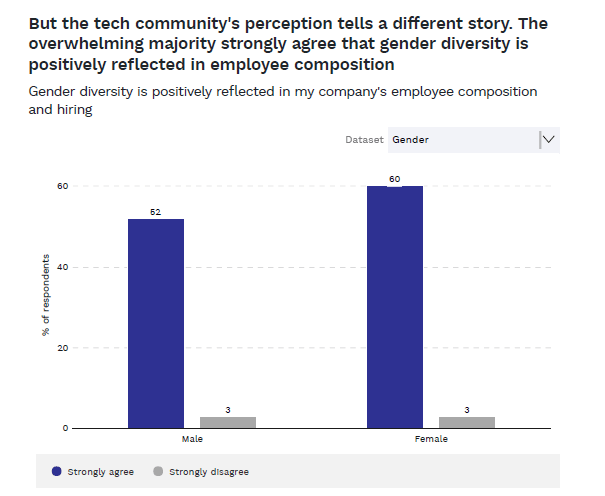 Gender diversity still has a long way to go as there are not enough girls getting into STEM fields due to stereotypes, said Kristel Kruustük, CEO of Testlio. Founders in Italy and Spain said they were the most challenged by regulation but founders from across the continent raised concerns with policy, firstly with taxation and secondly with data protection and privacy. Regulation is a double-sided coin. 2018 will be a pivotal year with the introduction of GDPR and PSD2 and the growing scrutiny and debates around encryption and initial coin offerings (ICOs). According to the Atomico report, there is “broad agreement” that there needs to be regulatory changes to incentivise AI, blockchain, and autonomous vehicle development. “The main challenge for European companies to scale up is the size of the market. A truly unified market with more common rules can help a lot of entrepreneurs. Furthermore, entrepreneurs need legal stability in order to launch new products and to innovate, they cannot do it if the legal ecosystem threatens to change. Entrepreneurs need to have faith in Europe, that means Europe needs to show them they can,” said French investor Xavier Niel. Some countries seem better placed to take advantage of these burgeoning technologies. According to respondents, Germany is best placed to take advantage of deep tech like robotics, autonomous vehicles, and quantum computing. Switzerland in particular is a popular destination for blockchain and cryptocurrency activity, while the report added that most ICOs in Europe are taking place in Central and Eastern Europe. 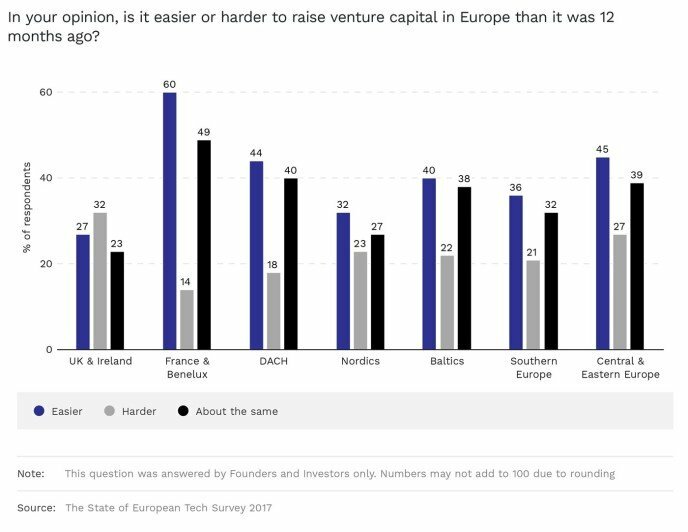 The Atomico report also espouses the view that European startups need to forge stronger ties with corporates and traditional industries both for investment and the flow of talent. For example, a lot of talent from the automotive sector is seeping into tech. This has also manifested itself with accelerators and startup programmes run by big corporates and direct partnerships with startups – such as Klarna/Visa and Deliveroo/Heineken. “The question of whether Europe can produce world-class innovation has been put to bed,” added Tom Wehmeier, partner and head of research at Atomico, who is the author of the report.